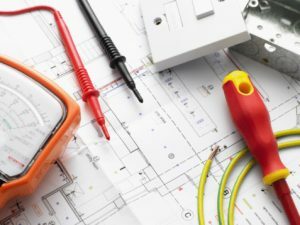 When you’re searching for the dependable choice in Voorhees commercial electrical contractors, D.P. Murt Inc. is your destination. D.P. Murt, Inc. is a veteran-owned company that has been providing comprehensive electrical and wiring services to South Jersey businesses for over three decades. We serve both commercial and industrial companies, and clients choose us for our reputation of solid work completed on time and on budget. Commercial Services. We can install a code-approved wiring system to replace your existing, out of date system, whether your business is a shopping center, apartment complex, or any other type of facility. We can also design and build a new electrical system…including installing new generators and HVAC systems, and performing energy consumption audits to save you expenses. Industrial Services. We employ professionally trained technicians to install or maintain your power sources and electrical systems, to keep your plant running and avoid expensive shutdowns. Our team can install and service generators, power wiring and most types of circuits, and we’ll install UPS and emergency systems for your backup needs. We also can upgrade your security system to protect your business against theft and keep your employees safe. Institutional Services. D.P. Murt is ahead of the curve in both energy-efficient lighting systems and in green technology that uses solar or wind power. If need be, we can provide you with a free lighting survey to see if you can upgrade your system to a more energy-efficient, cost-saving one. For more details about how we can help you keep your power systems running smoothly and efficiently, click on the services tabs and have a look at some of our completed projects. Whether you want to completely overhaul your electrical systems or just upgrade your existing ones, D.P. Murt Inc. has the experience and expertise to get the job done. When you’re ready to meet with us to discuss your power needs, click here for a free survey. We believe you’ll see what makes D.P. Murt Inc. the top choice in Voorhees commercial electrical contractors, and we look forward to making your business safe and efficient for the future.